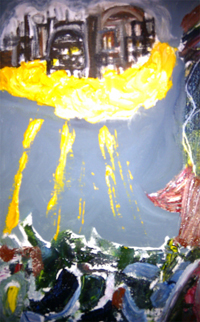 May 2005 | Audio CDR | ??:?? 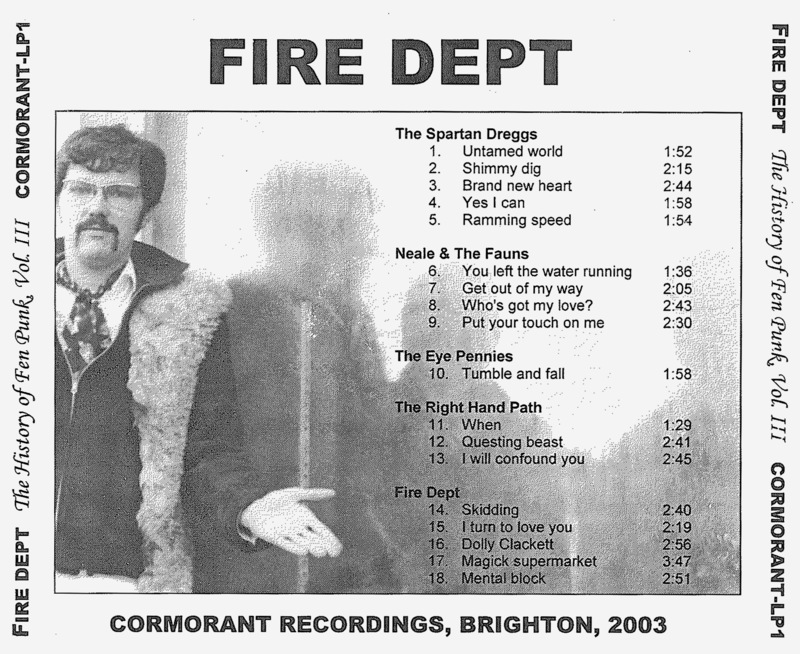 In the early days in Brighton the Fire Dept’s reputation was so poor that they were forced to adopt new aliases for each concert. 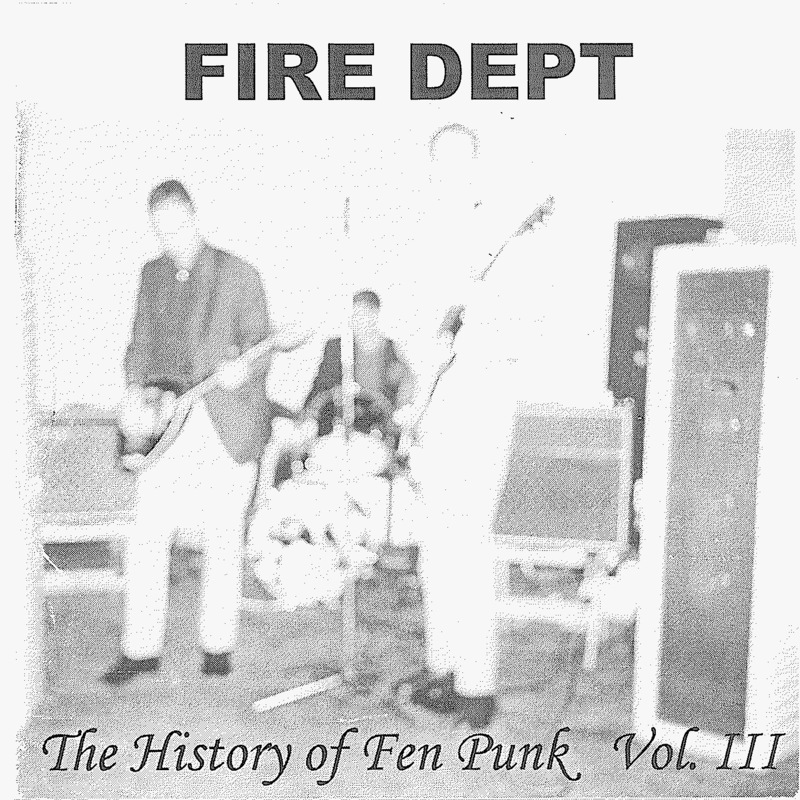 Brighton folk may remember some of the eye-catching A4 posters for The Vlads, The Cnuts, The Dreggs, The 3 Spartans, The Spartan Dreggs, Dogshit Patrol, The Eye Pennies, The Right Hand Path, Salivation Army, The Wineherds, The Ambulance service, Neale & The Fauns and the Fire Dept. Eventually, their Brighton audience became invisible, so they spent the early to mid-90s playing almost exclusively in London – usually in the fierce, exasperated presence of Slim Chance. 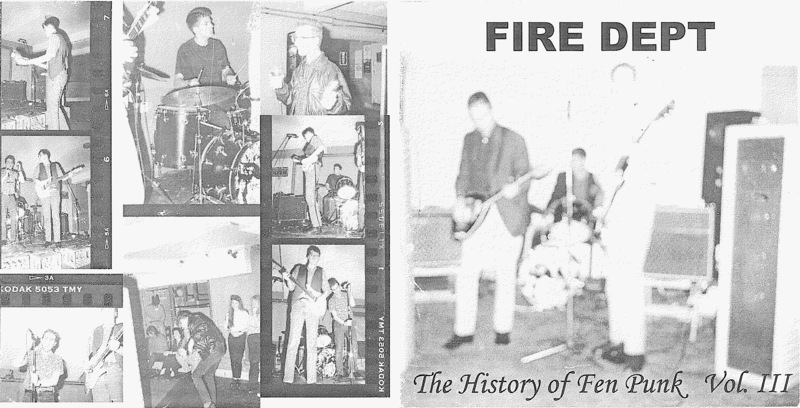 Despite having little talent, ambition, money, and continually pursuing shallow good times, they oplayed many concerts in England and abroad, including some with their all-time fave acts, such as The Mark Four/Creation, Link Wray and esse Hector. They also wrote vast numbers of beat tunes, some of which they bothered to record. 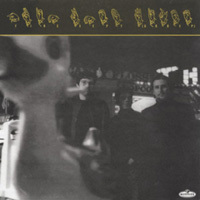 Their careless search for a sound culminated in the release of two LPs – the basic, mental “LÓeuf D’Or”” (1996) and the casual, blisteringly fresh “Elpee for Another Time” (1996). Billy Childish put out the first on Hangman’s Daughter, wile Colin Woodcock released the latter on Yep! Records. Both were made with a lot of help from Liam Watson at Toe-Rag. 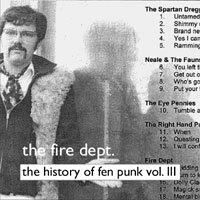 The Dept’s tendency to steal tunes is heavily on show here, with bits obviously nicked from the likes of The Sonics, Them, The Choir, Link Wray, he Lyres, The Outsiders, the Fabulous Jay-Jays, Alex Chilton and various Childish acts, not to mention the innumerable riffs lifted from 1,000 compilation LPs. My only regret is that their hot, soulful recording of All Saints “Never, Ever” – memorably sung to the tune of The Eyes’ “When The Night Falls” – has been lost for all time. Neale K. Richardson: vocals on all songs (except 2,10,14-18); bass (10). Neil Palmer: guitar on all songs; vocals (2,10-18); bass (11-13,15-18). Robin Taylor: drums on all songs; maracas (14).